Enjoy first-run movies under the desert night sky at Smith’s Ranch Drive-in in Twentynine Palms. Current featured movies and showtimes are available on the website. Admission is $5 per person for a double feature. Cash only. Children 3 and under are free. Open year-round on Thursday, Friday, Saturday, and Sunday nights after sunset. 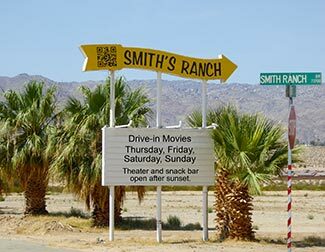 One of the last American drive-in movie theaters, Smith’s Ranch Drive-In opened in 1954, although outdoor movies were screened at the historic Smith Ranch as early as 1940. The drive-in has a capacity for 330 cars and shows first-run movies Thursday through Sunday nights, beginning right after sunset. Movies change every Friday. The drive-in theater’s concession stand features everything from popcorn, pizza, candy, and sodas, to nachos, hot dogs, and pulled-pork sandwiches. History: Desert pioneer Bill Smith arrived in 1923 in his Model-T Ford and developed the haven known as Smith’s Ranch. Bill and his brother, Harry, drilled a well and provided water to homesteaders, and Bill’s shower, swimming pool, and shade trees were a welcome place for locals to cool off on hot summer days. Bill married Thelma Mead in 1930, and the ambitious pioneer couple built an ice house, dairy, ice cream parlor, outdoor theater, and trailer park on their property, and a large recreation hall with partners Bill & Prudie Underhill of The Desert Trail newspaper. The Smiths had six children and were acclaimed as the first homesteaders to have a child born in Twentynine Palms. 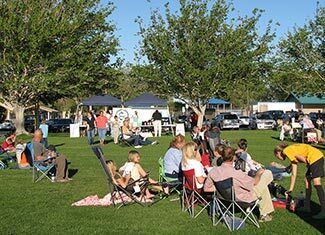 Free family-friendly movies are shown on Thursday nights during June and July in Luckie Park, under the beautiful desert night sky, presented by the City of Twentynine Palms Park & Recreation Department and local business sponsors. See our Calendar of Events for the weekly movies featured in June and July. Movies are shown on the north-facing wall of the racquetball courts, beginning after sunset, about 8:30 p.m. Bring a blanket, lawn chairs, picnic dinner, family and friends! Concessions are available for snacks and beverages. Admission is free, thanks to the City and the generous sponsorship from local businesses and service clubs. For more information, contact the Park & Recreation Dept. (760) 367-7562.